In this article, I will demonstrate how to perform MySQL database connectivity in Python using simple 5 steps. We are using MySQL Connector Python to connect MySQL. If you are using any other modules to communicate with MySQL don’t worry methods and examples included in this article also work for other DB Modules. Only you need to change the import statement. Password – Password is given by the user at the time of installing the mysql database. If you are using root then you won’t need the password. Database Name – Database name to which you want to connect here we are using Database named ‘python_DB’ because we have already created this for our example. Use the mysql.connector.connect() method of MySQL Connector Python with required parameters to connect MySQL. Use the connection object returned by a connect() method to create a cursor object to perform Database Operations. The cursor.execute() to execute SQL queries from Python. Close the Cursor object using a cursor.close() and MySQL database connection using connection.close() after your work completes. Catch Exception if any that may occur during this process. Note: Before proceeding further, please make sure you have MySQL Connector Python already installed. After this, you need to know the following detail of the MySQL database to perform the connection. To connect the MySQL database, you must know the database name you want to connect. Run below query on MySQL console if you have not created any Database in MySQL. Otherwise, you can skip these queries. Below is the last step, i.e. using functions of MySQL Connector Python to connect MySQL database. Let see the example now. After connecting to MySQL Server, you should get below output. This line imports the MySQL Connector Python module in your program so you can use this module’s API to connect MySQL. mysql connector Error object is used to show us an error when we failed to connect Databases or if any other database error occurred while working with the database. Example ER_ACCESS_DENIED_ERROR when username or password is wrong. Using this function we can connect the MySQL Database, this function accepts four required parameters: Host, Database, User and Password that we already discussed. connect() function established a connection to the MySQL database from python application and returned a MySQLConnection object. Then we can use MySQLConnection object to perform various operation on the MySQL Database. Connect () function can throw an exception, i.e. Database error if one of the required parameters are wrong. For example, if you provide a database name that is not present in MySQL, then Python application throws an exception. So check the arguments that you are passing to this function. is_connected() is the function of the MySQLConnection class through which we can verify is our python application connected to MySQL. This method returns a cursor object. Using a cursor object, we can execute SQL queries. The MySQLCursor class instantiates objects that can execute operations such as SQL statements. Cursor objects interact with the MySQL server using a MySQLConnection object. Using cursor’s close method we can close the cursor object. Once we close the cursor object, we can not execute any SQL statement. At last, we are closing the MySQL database connection using a close() function of MySQLConnection class. 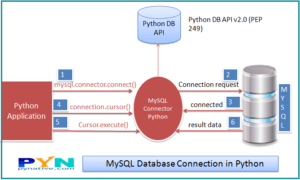 Now you know how to connect to MySQL server from python. You can try various MySQL operations through python by referring to the following articles. As you already know we can connect to MySQL Server from python Using a mysql.connector.connect() function or the mysql.connector.MySQLConnection() class. We already discussed the four mandatory arguments required to connect the MySQL Server. Let see what the other connection arguments we can use to communicate with MySQLServer from Python are. Following is the list of all other connection arguments and its example. port: The TCP/IP port of the MySQL server. This value must be an integer. We can specify the different port if MySQL server is listening on the different port. The default Value for this port argument is 3306.
use_unicode: Whether to use Unicode. The default value is True. charset: MySQL character set to use, character set variables relate to a client’s interaction with the server. There are almost 30 to 40 charset MySQL server supports. The default value of the charset argument is “utf8″. auto-commit: Whether to auto-commit transactions. If you want to manage transactions in MySQL from Python, you need to set this value to true or false. The default value is False, i.e. the changes are not committed to the database. You need to explicitly call commit method to persist your changes in the database. get_warnings: To fetch warning, this is helpful to know the connection is established but with warnings. The default value is False. raise_on_warnings: Whether to raise an exception on warnings. The Default value is False. connection_timeout(connect_timeout*) : Timeout for the TCP and Unix socket connections. The connection terminates after this timeout expired. buffered: Whether cursor objects fetch the results immediately after executing queries. The default value is False. raw: Whether MySQL results are returned as is, rather than converted to Python types. The default value is False. You can set it to true if you want a query result in python type. force_ipv6: When setting to True, uses IPv6 when an address resolves to both IPv4 and IPv6. By default, IPv4 used in such cases. The default value for this argument is false. pool_name: It is Connection pool name that you are creating or using. pool_size: Connection pool size that you want to create. the default value is 5.
pool_reset_session: Whether to reset session variables when the connection returned to the pool. the default is True. use_pure: Whether to use pure Python or C Extension. If use_pure=False then pure python module is used otherwise it connects MySQL using C extension. Moreover, if C Extension is not available, then My SQL Connector Python automatically fall back to the pure Python implementation. unix_socket: The location of the Unix socket file. These enable communication between two processes. auth_plugin: Authentication plugin to use. Added in 1.2.1.
collation: MySQL collation to use. you can use the collation that you set while installing MySQL Server. The default value is utf8_generalW_chiich. sql_mode: Set the sql_mode session variable at connection time. Furthermore, let see how to use a dictionary to store all of these connection arguments. If you have lots of connection arguments, it’s best to keep them in a dictionary and use the ** operator. for an example, you know you require a minimum of four arguments (i.e., username, password, hostname, database name) to connect MySQL. Sometimes in exceptional cases, we need more than four arguments in the connect method to connect MySQL database. Let’s understand this. For example below are three more connection arguments we can use in the connect method. pool_size – Connection pool size if you want to use connection pooling. You can use many other connection arguments as per your need and add them all in a dictionary and pass a dictionary to connect() method. Let’s demonstrate above with the below example. Sometimes we need to change the connection timeout value if we are reading or inserting a large data to the MySQL server. Then how to change the default Mysql connection timeout when connecting through python? We can do this using a connection_timeout argument of MySQL connector python to manage the timeout issues by increasing the timeout value. connection_timeout is the timeout value in second for the TCP and Unix socket connections. This time denotes the number of seconds the MySQL server waits to fulfill the current request. Connection terminates If the request takes more time than this value. Also, you can set the following Parameters of MySQL server by executing SQL query from python to handle the connection timeout issue. Change the value of the following parameters only when connection_timeout argument alone can’t handle the timeout issue. interactive_timeout – the number of seconds the server should wait for activity on an interactive connection before closing it. wait_timeout – Number of seconds the server should wait for activity on a connection before closing it. You can set connection_timeout values as per your requirement. Let see how to manage MySQL connection timeout through python using an example. As you can see I have set all connection timeout value to 180 seconds, i.e. 3 min in the above program. Let’s discuss other connection approaches below. First, we need to understand why to use a C extension. Python connector module has a C Extension interfaces to connect MySQL database. As of Oracle’s Connector/Python “use_pure” connection argument determines whether to connect using a pure Python interface to MySQL, or a C Extension. The default value of “use_pure” is False means it uses the pure Python implementation to connect that we already discussed. Example to Connect to MySQL Using the Connector/Python C Extension. Below example demonstrate the same, connect by setting the use_pure value to true in the connect() call. How to connect mysql from my PC using python? Are you facing any specific problem? Yes..i cannot connect my db from my laptop..i use shared hosting..i think need hosting login.. I keep getting mysql.connector.errors.ProgrammingError: 1698 (28000): Access denied for user. Any troubleshooting tips? I am using the module you had recommended.